Sholeh Ehdaivand, CEO of LMK Consulting and Frederico Braga, principal of platform strategy and adoption at Medidata, recently spoke on a webinar how using technology such as Medidata Clinical Cloud can automate the management and creation of trial master files – accelerating processes such as study start-up for clinical ops and clinical IT. We also learned that 94% of participants believe that compliance findings such as inspection delays due to incomplete or missing documents and deficiencies for essential documentation are correlated to the use of email and paper for collaboration. Medidata eTMF addresses all of these challenges by offering a solution that is fully integrated within the Medidata Clinical Cloud, the industry’s most complete eClinical platform, providing a single source of truth from study planning to study close. How can Medidata change the game of how Trial Master Files are managed? Medidata is able to help sponsors improve their TMF Management approach from one that is passive or active to an approach that is automated. We can do this because of the depth and breadth of the data and content within the Medidata platform. According to the DIA reference model, TMF consists of 249 artifacts, of which 190 – or 76% – can be automated from the Medidata platform. By automating the collection and management of TMF artifacts, not only do we make sponsors’ jobs easier, we accelerate study start-up and decrease compliance risks such as incomplete or missing documents. How can LMK Consulting help you overcome your TMF challenges? LMK is ready to optimize your TMF Trifecta: TMF People, TMF Processes and TMF Technology. 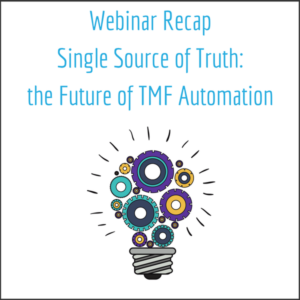 The TMF Trifecta represents the real-time interplay of your TMF stakeholders, the actions those stakeholders complete, and the technology necessary for them to successfully and efficiently carry out their role. LMK will be your TMF ally: identifying and empowering your TMF stakeholders (whether one person or many thousands), establishing and maintaining metrics of TMF quality and completeness, and implementing tools and processes that are sustainable for the entire lifecycle of the TMF.